This week we introduce YungShrugga and YK Osiris to our Trendsetters Chart! Take a listen to their artist station on Pandora today! In the past month, YungShrugga has gone from 0 to 100 -- more specifically, seeing a nearly 18,000% lift in Pandora artist station adds month on month. It's all thanks to his new project Distant 2, which he dropped on January 25 as the followup to 2018's Distant. The album has also helped the Nashville-based rapper see a 260% increase in spins and a 350% increase in thumbs up month on month. 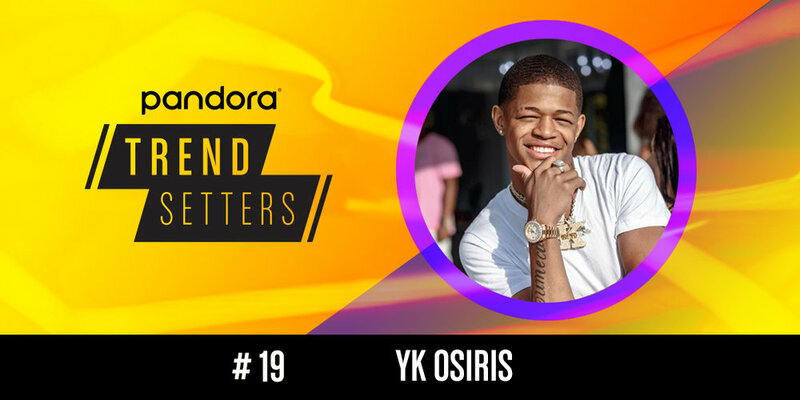 After a month on the Pandora Predictions Chart, Jacksonville, Fla.- born rapper YK Osiris makes his debut on Trendsetters with over 2,200 artist station adds in the past week on Pandora. Osiris, who first broke out with the song "I'm Next (freestyle)," has seen a big bump lately from "Secret," a collaboration with R&B singer Ann Marie. Newer PostSee You at SXSW 2019!